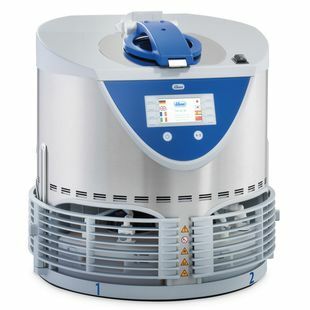 Automatic cleaning with vacuum technology and integrated explosion protection. The Elmasolvex VA is a completely automatic cleaning machine for cleaning mechanical precision parts such as gear wheels, springs or cases. Cleaning with multi-frequency ultrasound and rinsing are performed in the rotation or oscillation process. The vacuum technology also reaches difficult to access places and removes all air bubbles. The user is protected from toxic solvent fumes or odours by extraction equipment or a self-contained filter system. The Elmasolvex VA has its own self-contained intrinsic explosion protection due to the vacuum technology used and all the tested measures required by TÜV and the EU standards for explosion protection. This means that the explosion protection measures integrated in the machine rule out any fire hazard when the machine is used for its intended purpose. The use of ultrasound is thus legally possible and permitted.